Boudinot was a close friend of Washington's, and a tireless supporter of the Revolution and the fledgling federal government. He was a member of the N.J. Committee of Safety, 1775; commissary general of prisoners of the Continental Army, 1776-79; N.J. delegate to the Continental Congress, 1777-1784, and its president, 1782-83; signer of the peace treaty with Great Britain which ended the revolutionary war; member of the U.S. House of Representatives, 1789-95; and director of the U.S. Mint, 1795-1805. In early 1793, he led the defense on the attack on Hamilton's conduct of the federal Treasury. An Early Stock Certificate Issued To Elias Boudinot A President of Continental Congress And Signer Of The Peace Treaty Which Ended The War With Great Britain! 1817. Newark, New Jersey. Stock Certificate for 2 Shares. Black White. 7 7/8” x 5 ¾ “. Issued to Elias Boudinot, the tenth President of Continental Congress. In 1806, the New Jersey General Assembly chartered the Essex and Middlesex Turnpike. Elias Boudinot’s brother and future Chief Justice of the Supreme Court of New Jersey Elisha Boudinot was a commissioner and majority share holder of the company from its onset. 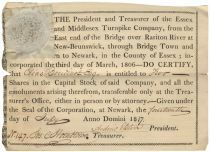 Elisha was among a group of New Jerseyans authorized to “receive subscriptions for erecting a turnpike road, four rods wide, from the east end of the bridge over the Raritan river at New Brunswick, through Elizabethtown to Newark, in the count of Essex…” The subscription of stock was authorized at 3,000 shares of $50 each. The goal of the turnpike was to both improve the New Brunswick to Newark road and to connect that road with the Trenton and New Brunswick Turnpike in New Brunswick. A Choice rarity displaying this important early political investing in the growth of America. BOUDINOT, ELIAS (1740-1821). Revolutionary statesman. Boudinot was a close friend of Washington's, and a tireless supporter of the Revolution and the fledgling federal government. Despite not signing the Declaration of Independence, the Constitution, or the Articles of Confederation, he is one of the more important political figures from the American Revolutionary Era. After serving as a delegate to the Continental Congress, Boudinot became the Secretary of Foreign Affairs. Due to his immense successes in dealing with the aid provided by France, Spain, and Holland, Boudinot was selected to be the 10th President of the Continental Congress in 1782. Boudinot singed the Treaty of Paris while in office as President of the Continental Congress in 1783. After he served as President, Boudinot was elected as a U.S. Representative from New Jersey in 1789. Although he retired after one term, George Washington appointed Boudinot to become Director of United States Mint. Boudinot held the position from 1795-1805.